These photos are for research only. If the item is in a private collection and not for sale it will be marked NFS otherwise please contact the website or the person noted in the description for more information about an individual item. Copying of photos is not permitted without permission from the website owner or person noted in each description. All rights reserved. This Fabiola set is only signed on the hang tag. The original price was for $4.00 for the necklace. 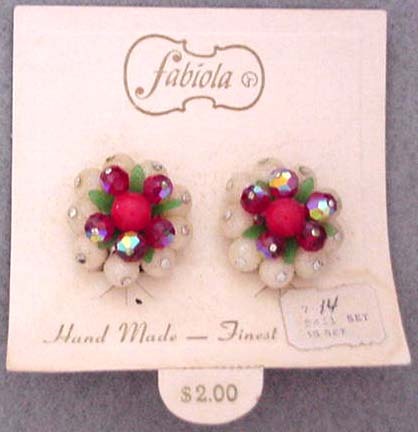 The reverse of the tag reads "Made by hand in USA exclusively by Fabiola". The dark green crystal beads have some aurora borealis coating on them. 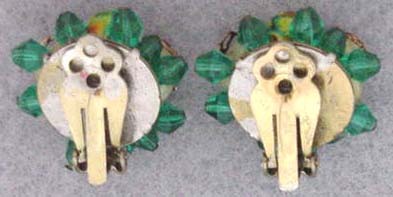 The gold colored beads are metal and the green beads look like they are green sugar coated. 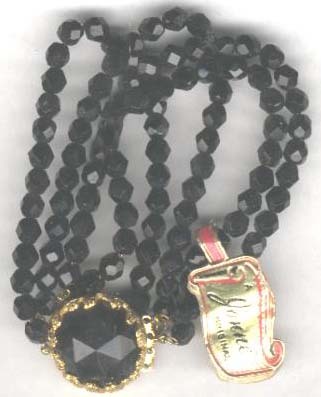 The necklace is 17 1/2" with 2 1/2" of adjustment (15-17 1/2") and the earrings are 1" across. This is new old stock from the 1950's. [larger view] Courtesy of Clerestorial. Unmarked except on the hangtag, this Giovanni set is in unworn condition. 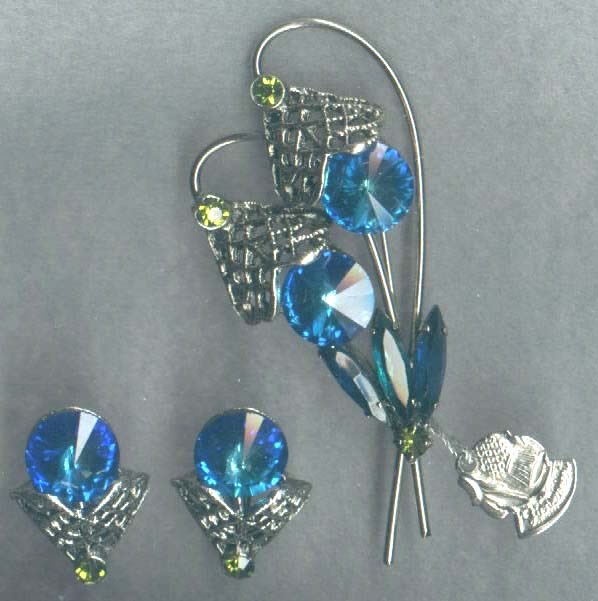 The brooch has 2 large rivoli foil backed stones, 3 round peridot rhine-stones and 3 open backed skinny navettes. The navettes are blue, green and blue. 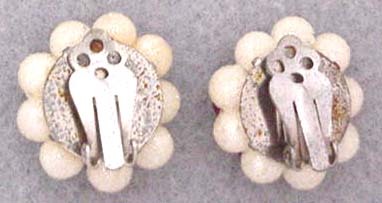 The earrings are 1" high by 3/4" wide and the brooch is 2 7/8" long and about 1 1/2" wide. [larger view] [back view] [scanned] Courtesy of Clere-storial. 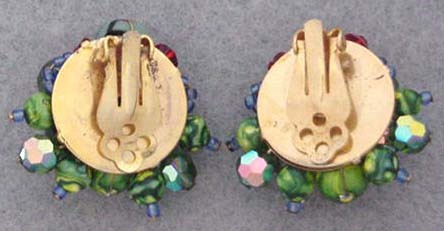 Same earrings as previous photo in a different color. Also unmarked. [larger view and back view] Courtesy of Crystal Violin. Same brooch as previous photo in a different color. Also unmarked. [larger view] [back view] Courtesy of Antiques by Evelyn. 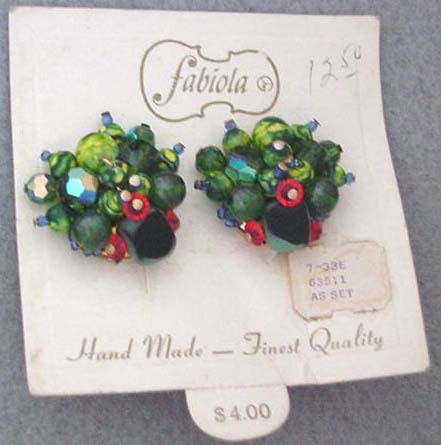 Fabiola carded earrings NOS (new old stock) dating from the 1950's. A tad over 1" across. Art glass stone in the center with gold and red swirls surrounded by topaz colored stones some with a/b coating and brown balls with gold flecks. [larger view] [back view] Courtesy of Clerestorial. 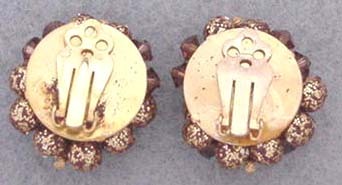 Fabiola carded earrings NOS (new old stock) dating from the 1950's. A bit over 1 1/8" across. Neat green irregular bead on the bottom, cut to black on top. Green swirl beads in 2 sizes, green round faceted glass beads in 2 sizes with some a/b coating and bright orange crystal beads for highlights. 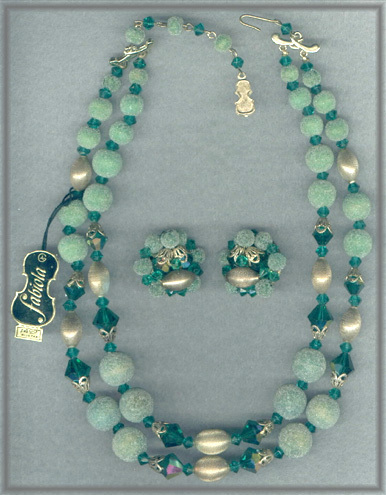 The small green swirl beads are topped with a small round blue bead. [larger view] [back view] Courtesy of Clerestorial. 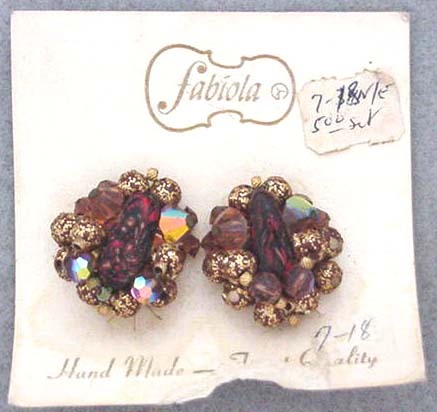 Fabiola carded earrings NOS (new old stock) dating from the 1950's. 1" across. Sugar coated style of white glass beads are on the outside, green plastic 'leaves' surround faceted red crystals with some a/b coating and the center is filled with a plastic red bead. [larger view] [back view] Courtesy of Clerestorial. 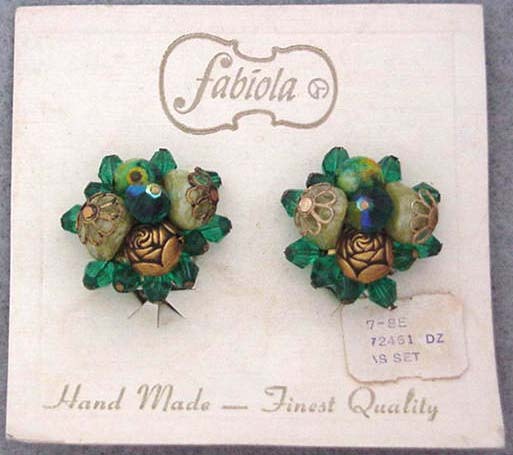 Fabiola carded earrings NOS (new old stock) dating from the 1950's. 1" across. 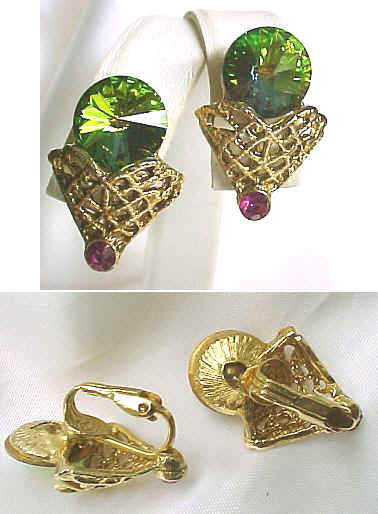 Irregular shaped green stones are paired with a gold rose, a multi-colored art glass stone and a partially coated a/b crystal to form the center. Faceted green crystals form the perimeter. [larger view] [back view] Courtesy of Clerestorial. This double strand of faux pearls was sold to me at an all-jewelry auction in its original box. 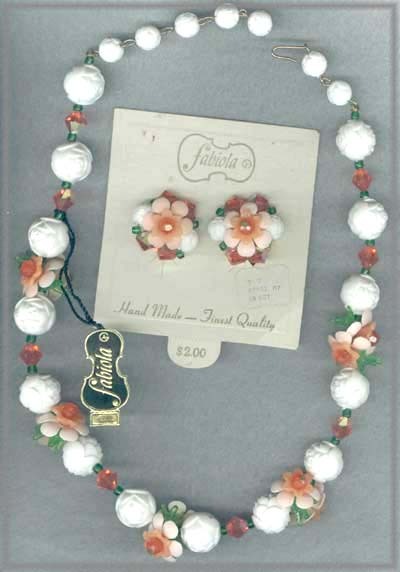 They are strung on a hand knotted silk cord, and have a fancy clasp similar to that shown on on a triple strand of Coro pearls on page 67 of Fred Rezazadeh's "Costume Jewelry: A Practical Handbook and Value Guide." 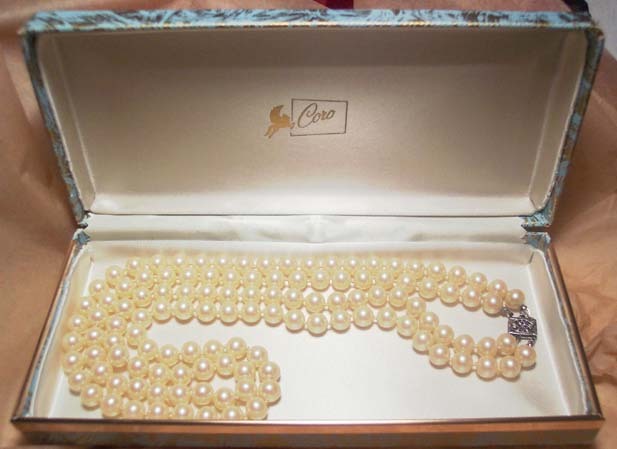 According to Mr. Rezazadeh, Coro pearls in good condition are rather hard to find. 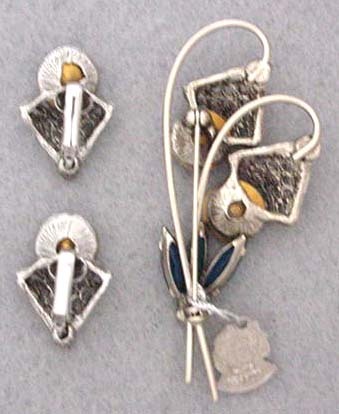 This set is in very good condition, with just a bit of green on two of the bead caps. They come in their original box with the Pegasus Coro symbol inside. [larger view] Courtesy of Yesterdays Jewels. This vintage bracelet is marked with the original tag reading 'A Jonne' Original' on one side and 'by House of Schrager' on the other. 4 strands of faceted glass on chain measuring 8". [larger view] Courtesy of Another Peacock Boutique. From the 50's, this unsigned brooch is still in it's original box. Marked with the Coro Pegasus logo on the lid. 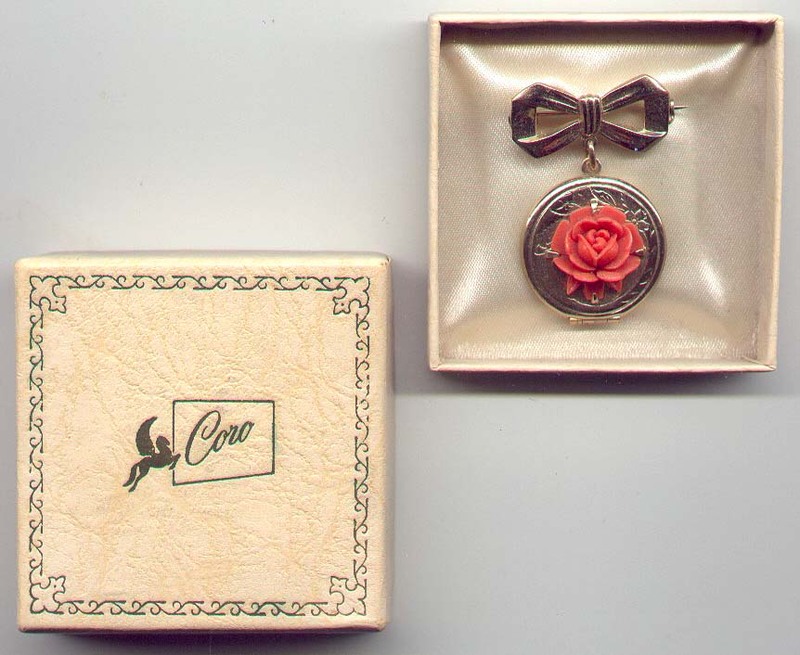 The box and brooch are both in pristine condition. The brooch looks like it's never been worn, possibly never even been removed from it's satin-lined box as there do not appear to be any other holes in the satin lining. 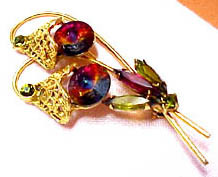 Set in gold plating, the brooch is 1.25" wide and 1.75" long. It is also a locket though it does not have film overlay, but the photo rings are still intact. [larger view with box] Courtesy of Hollihox Vintage Treasures.